Ho-Hum is a small adults only resort, big rig friendly with 55 full hookup sites located in a protected area of the Forgotten Coast. All sites are 30/50A except 20-22 & 24-26 which are 30A only. 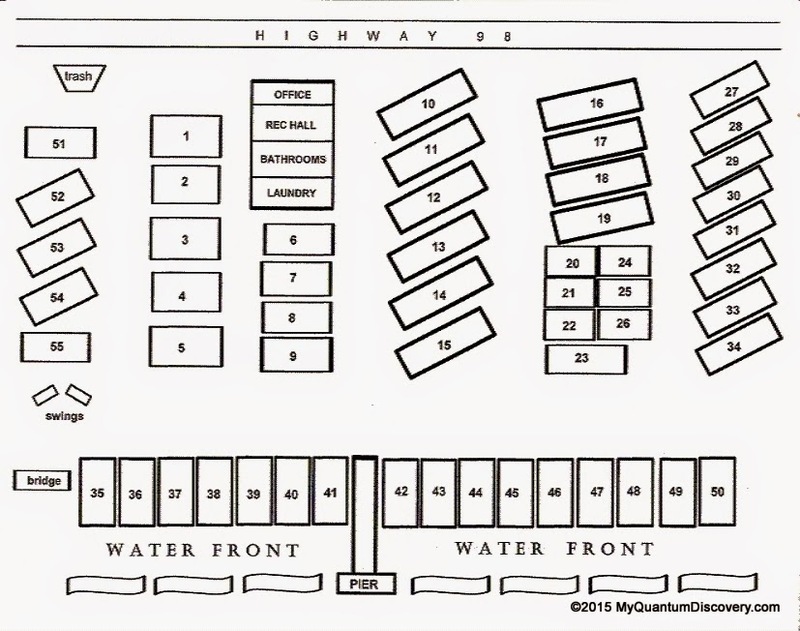 Sites 35-50 are directly on the beach front. Several of the interior sites are pull thrus up to 65 feet. Roads and sites are a packed gravel/shell combo. Mature trees thru out the park provide some shade to the interior sites. We’ve stayed here twice on beachfront sites #39 and #45. The rate for a beachfront site is $39, interior 30 amp sites (20-22, 24-26) are $29 and other interior 50 amp sites are $33. A 10% Good Sam discount is available off those rates. Weekly and Monthly rates are available as well at less than the Good Sam daily rate. See the rate sheethttp://www.hohumrvpark.com/rates-map.html for full details. Note that you cannot reserve a specific site by number, but you may reserve a type of site; beachfront, non-beachfront, pull-thru or back-in. A pleasant and safe feeling place, with the added bonus of no kids if that’s not your thing. Everyone was friendly and we felt as if there were almost a cult like following for this place. The beachfront sites are very unique and our impression was certainly more than bolstered by them. There’s something about surf and sand that just activates those peace and tranquility inducing endorphins. Staying on an interior site however would likely not be much more than ordinary. We ran into a few couples who had stayed the season here, although we would not personally consider doing that. All in all a very pleasant place to stay and we will definitely be back. Spacing: All the sites, including the beachfront sites are pretty close together but even so we still had adequate space on the passenger side, room enough to park the car and put out our awning. A small picnic table was provided. 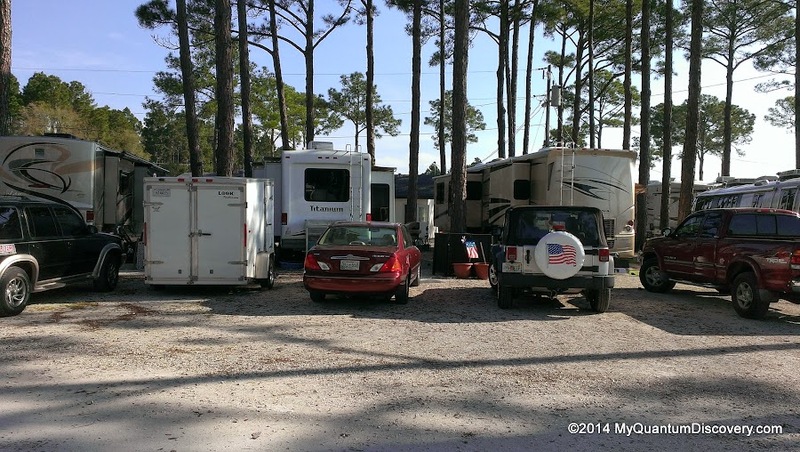 One anomaly of this park for the beachfront sites is that motorhomes will want to pull in front first, but 5th wheels and trailers will need to be backed in. That means the utilities need to be duplicated on both sides of the site. And if a 5th wheel or trailer occupies a site to the left of a motorhome, they will be very close together on the motorhome’s driver side. This was the case with us on our first visit on site #45, but was not a problem, there were two sewer hookups, two electrical hookups and a shared water spigot with a Y adapter. Privacy: There is basically zero privacy (with the possible exception of site 35) but the awesome view on the beachfront sites makes up for the close quarters. Non beachfront sites are equally close together and lacking in privacy, but all sites are within 250 feet of the water and some may have partial views. Each site has a picnic table, free wi-fi and free cable. General amenities include laundry facilities (we did hear some complaints about the cost of the laundry machines), a rec hall and a 250 ft. lighted fishing pier. One quarter mile of undeveloped beachfront adjoins the campground, good for shelling, sunbathing, launching a kayak or just walking a dog. Ho Hum is located not too far from the main town of Carrabelle where there is an IGA grocery store and several restaurants. Closest Walmart is in Crawfordville which is approximately 28 miles away. St. George Island State Park (on a barrier island) is about 42 minutes away with beautiful beaches on the Gulf . The shore here at Ho Hum and most of the surrounding mainland is protected by barrier islands, so the surf is relatively tame compared to beaches directly on the gulf. One stormy day with a strong 25 knot onshore breeze (small craft warnings) the worst we saw were 1-2 footers, but even so, at high tide we were still taking a bit of spray on the windshield. Under normal conditions it is quite peaceful and serene and a nice cooling on shore breeze prevails in warm weather. Also note that the “beach” here at Ho Hum is not a wide expanse of “barking” sugar sand like you will find at places with direct Gulf exposure like St George Island and other areas to the west along the Emerald Coast, but is relatively narrow and in some areas littered with tree stumps and roots. Within the campground there are large rocks placed along the beach head to minimize erosion and during high tide the beach itself may be completely eclipsed. Even so it is still good for wading, fishing and boating – we saw several people launching kayaks and outboard powered inflatables directly from the campground. Plenty of room to maneuver a big rig within the resort. Check out our dash cam video of our arrival. Although it is located on a fairly busy road, US98, we didn’t notice the traffic noise, probably because the sound of the waves minimized any of the undesirable street noise. Occasional military aircraft flew overhead. Satellite – DISH Network Western Arc (110, 119, 129) no problem at waterfront sites, probably OK at most other sites but there could be exceptions. WiFi – Wifi is offered with enough Access Points available to give sufficient coverage to the entire park. It was usable but as is the case in most parks it was slow (compared to our normally speedy Verizon LTE service), particularly during peak times. Cellular signal – Moderately good 2 bar Verizon 4G LTE signal on our 6620 MiFi coupled with a Wilson Sleek signal booster. Over-the-Air (OTA) TV – OTA reception was non existent. Cable is provided but we did not try it. Power – Very good, 120v plus on both legs even under load. BUT, no breaker at site so must plug/unplug hot. This is one of the few campgrounds without a readily accessible breaker. We don’t know if this is just an anomaly of the waterfront sites or is pervasive thru out the park. Water Pressure/Quality – Water pressure a bit low at 35 and we noticed additional drops in pressure at peak times. Quality is good with only a slight chlorine odor. – The view, the view, the view (on the beachfront sites) – can’t get much closer to the water. – No young kids allowed here (just old ones). As you drive by, don’t be put off by the overall appearance (like we were last year) – it is an older park and from the street it looks as though all the sites are really packed together, but they are not really too bad and everyone we encountered was friendly. Oh, and did we mention the view? – Amenities are limited but we didn’t really care as we seldom use park provided facilities. – Gravel/sand roads so all the usual issues with that. During rain the ground remains firm but puddles abound and tracking sand becomes a more significant problem. – Problem with bears in general in Carrabelle. We didn’t see any but apparently a day or two before we arrived a bear was spotted in the park, causing us to be a little nervous when walking along the beach or going to the dumpster. 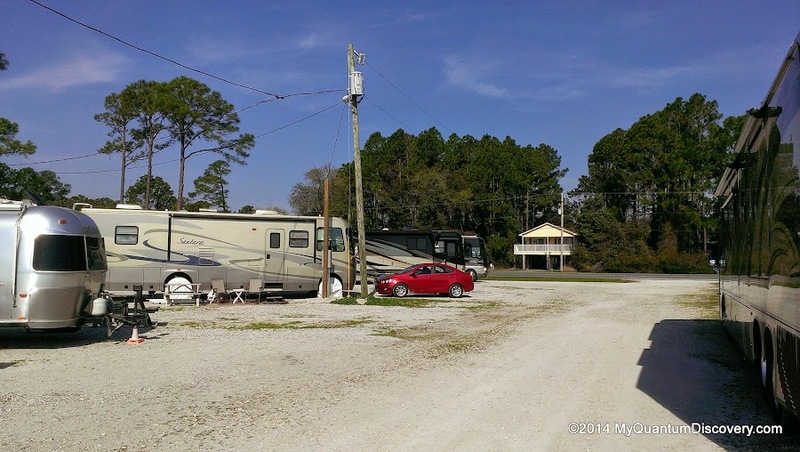 The interior sites at Ho Hum are not necessarily better or worse than other campgrounds in the area so unless you have a beachfront site here there is no particular advantage to staying at Ho Hum. 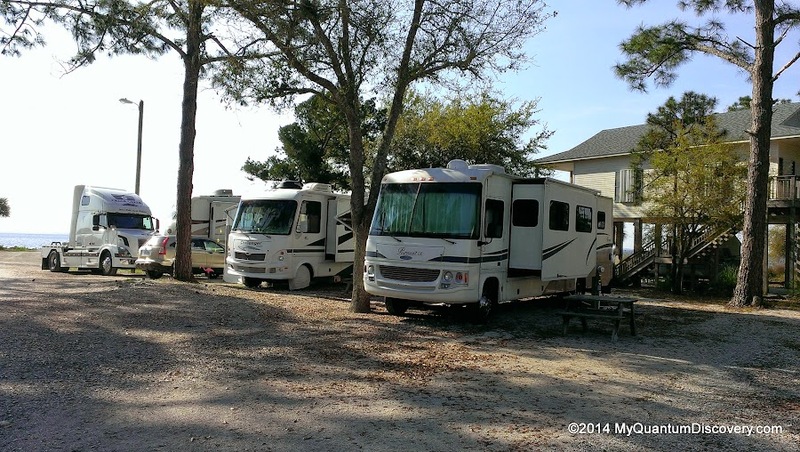 – Coastline RV Resort, Eastpoint, FL. 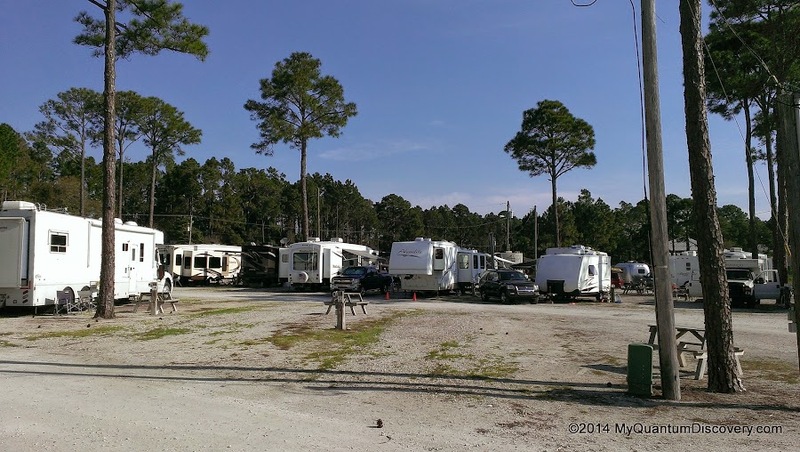 We checked this place out and it is actually two campgrounds about a quarter mile apart on US98. The eastern facility is called a “Resort” and is trying to live up to that description with paver pads, a clubhouse, pool and such. IT was OK but had little to no privacy among the moderately sized sites. While there may be some views from some sites, note that it is not directly on the water but across the street from the shoreline and on the north side of US98. Rates hover around the $60 mark, way high in our opinion. Further west is the “Campground”, also on the north side of US98 but with grass sites. Views are about the same as the Resort and rates are in the $35 range. Full Hook-up at the Resort, presume the Campground is as well but best to ask. For us, Ho-Hum beachfront sites trump anything here, but the lower priced campground would be our choice if no Ho-Hum beachfront sites were available. 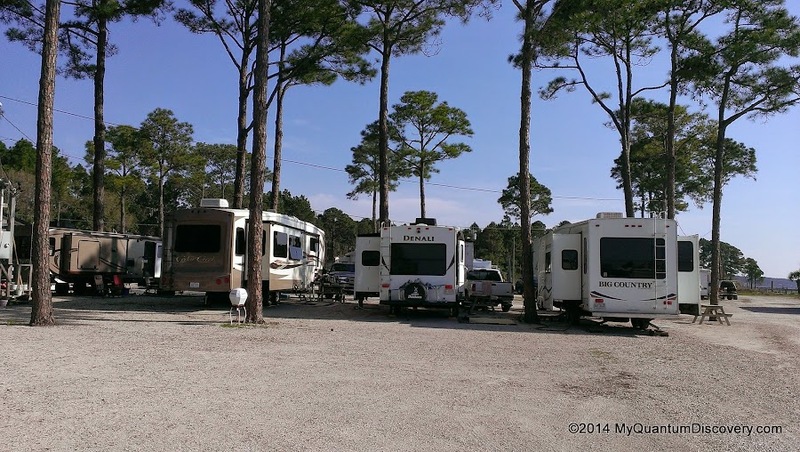 – Carrabelle Beach RV Resort, Carrabelle, FL (We have stayed here, see our previous post). Nice and well run park. Walk across the street to a decent beach (which may get crowded at peak times as it is a public pavilion). 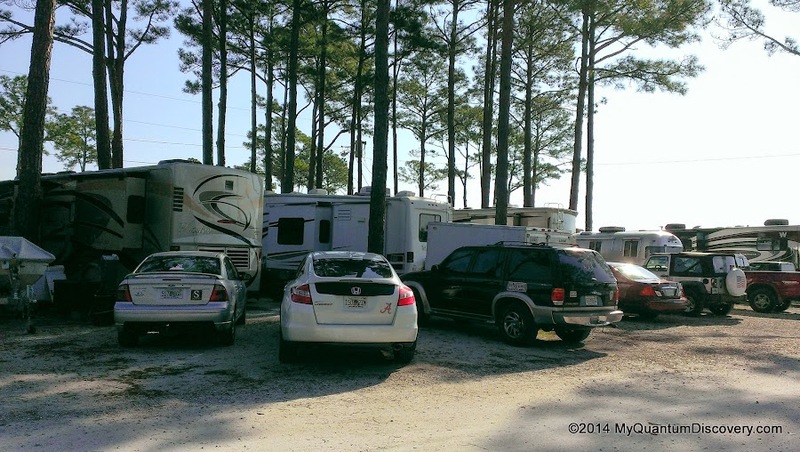 Despite all sites having concrete pads, many are cramped and maneuvering is tight for motorhomes 40′ and up. Also, many are nowhere near being level. Full hook-up. 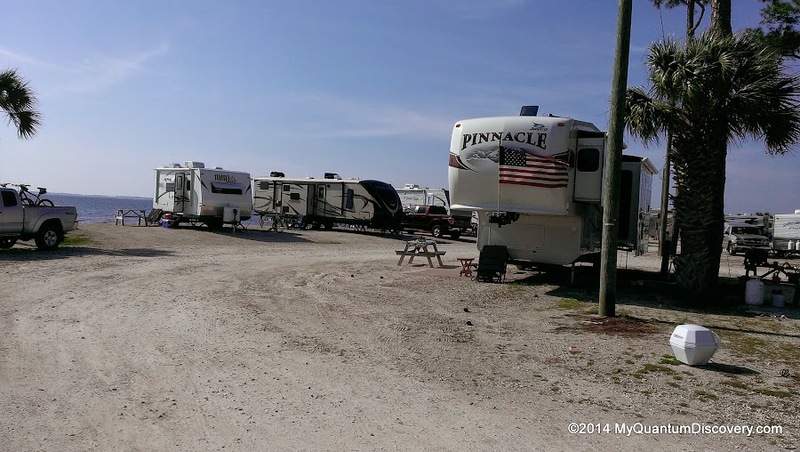 – Sunset Isle RV Park, Carrabelle, FL. We drove thru this park which is the closest to Carabelle and it appears to be another failed ownership “resort” that has reverted to supporting transients. It was in a bit of a dumpy area near a marina but would be OK in a pinch for a few nights. It is not a destination campground in our opinion although some would see it otherwise. Not much site privacy but the sites were decent size and appeared level. Full hook-up and a pool. 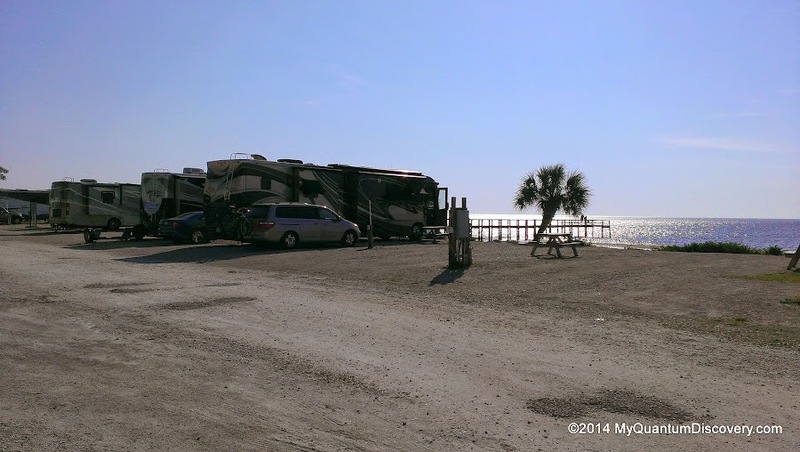 – St. George Island State Park, St. George Island, FL (we have stayed here, see our previous post). A long way from anywhere but beautiful direct on the Gulf beaches (not at the campground). Campground is on the lagoon side but there are no direct water sites. No sewer. Among this group, in the full Hook-up category Ho-Hum beachfront sites would be our top choice. For the lowest rates and a much more natural setting away from it all St. George Island can’t be beat. – Two Al’s at the Beach Cafe, Carrabelle. Open for breakfast, lunch & dinner – we only went here for breakfast twice. A bit of a dive but it was good and reasonably priced. – Bayside Burgers, Eastpoint. Great burgers, would definitely return!